There were some people who wanted to really focus on Obama’s background in 2012, but I wasn’t one of them. Voters evaluate a politician on his background before he’s elected, but after he’s elected, they evaluate him on his record — unless he’s Obama, in which case he’s still evaluated on promises he makes about what he’s going to do one day. So, if there was a time to do it, it was in 2008 and the best person to do it was the Vice-Presidential candidate because she had the juice to make people pay attention. Unfortunately, Sarah Palin says the McCain campaign didn’t want to get its hands dirty. In this sneak peek clip of the special, Greta talks to Sarah Palin who exposes that in her 2008 vice presidential run, she was forbidden from talking about Obama’s relationships with both Jeremiah Wright and Bill Ayers, as well as his job experience. 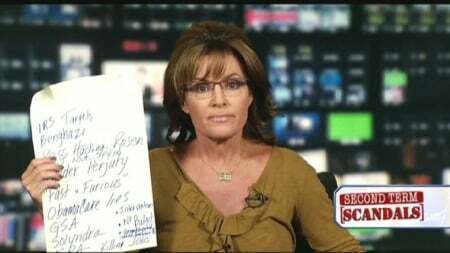 “What that got us, this kind of complacency and self-censoring of a campaign where we weren’t allowed to tell the truth about who this candidate was — Barack Obama — what it got us was a list of these scandals,” Palin charged. So, the McCain campaign decided not to go after Obama’s radical background because it would upset the media? That sounds about right. McCain spent his entire career sucking up to liberals in the media and when he needed them most, they portrayed him as a crazy, out-of-touch old man. Maybe instead of worrying about making the media happy, McCain should have worked on making the base happy by fighting as hard as it took to win the presidency. The country certainly would have been better off if he had.